UAlbany Men’s Lacrosse Coach Scott Marr surprises a guest. ALBANY, NEW YORK; – The head coach of UAlbany Men’s Lacrosse made a special visit to the Dunkin’ Donuts restaurant in Latham, NY, today to surprise guests in celebration of Iced Coffee Day and the Great Danes advancing to the semi-final round of the college men’s lacrosse tournament. 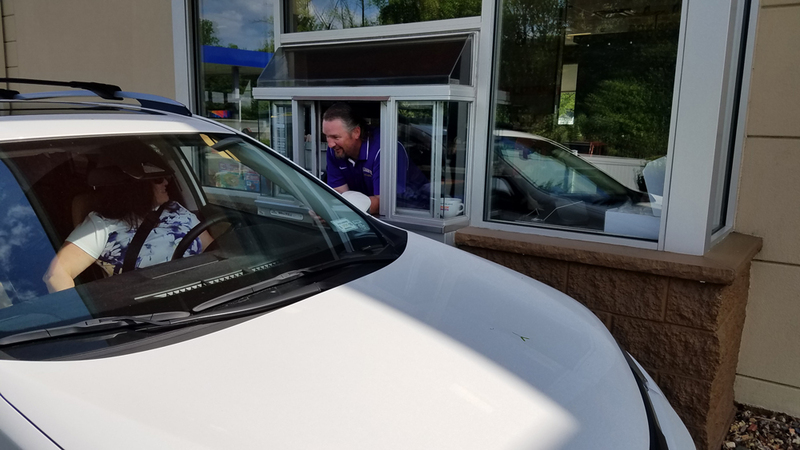 Coach Scott Marr filled orders at the register and drive-thru of the Latham Dunkin’ Donuts restaurant and his team will compete in the semifinals of the college men’s lacrosse tournament this Saturday, May 26. It will mark the Great Danes first-ever appearance in the national collegiate semifinal round as the team continues its quest to secure the first national championship in school history. Coach Marr was invited by Dunkin’ Donuts to help celebrate the return of “Iced Coffee Day.” On Wednesday, May 23, $1 from every cup of Iced Coffee sold at participating Dunkin’ Donuts restaurants in the Capital Region directly benefitted the Bernard & Millie Duker Children’s Hospital at Albany Med. Since its inception in 2012, Iced Coffee Day has generated more than $183,000 for the Bernard & Millie Duker Children’s Hospital at Albany Med. In addition, the Dunkin’ Donuts Joy in Childhood Foundation previously granted $20,000 to support the hospital’s Child Life Program. The Bernard & Millie Duker Children’s Hospital at Albany Med is a 125-bed facility devoted exclusively to the medical needs of infants, children and adolescents and is the referral center for all seriously ill and injured children from 25 counties in upstate New York and western New England. It is staffed by 140 physicians trained in 40 subspecialties and more than 400 pediatric nurses, therapists, social workers and child life specialists. Dunkin’ Donuts keeps Capital Region families and fans running all day long with Iced Coffee, both at home and on the go. Guests can customize their Iced Coffee in Dunkin’ Donuts restaurants to be just the way they like it, with many different dairy, sweetener and flavor options. Dunkin’ Donuts is the market leader in the Iced Coffee category, delivering refreshing Iced Coffee to guests every day, with a consistently smooth, delicious taste. To learn more about Dunkin’ Donuts, visit www.DunkinDonuts.com or follow us on Facebook (www.facebook.com/DunkinDonuts) and Twitter (www.twitter.com/DunkinNYCAP ). Founded in 1950, Dunkin’ Donuts is America’s favorite all-day, everyday stop for coffee and baked goods. Dunkin’ Donuts is a market leader in the hot regular/decaf/flavored coffee, iced coffee, donut, bagel and muffin categories. Dunkin’ Donuts has earned a No. 1 ranking for customer loyalty in the coffee category by Brand Keys for 12 years running. The company has more than 12,500 restaurants in 46 countries worldwide. Based in Canton, Mass., Dunkin’ Donuts is part of the Dunkin’ Brands Group, Inc. (Nasdaq: DNKN) family of companies. For more information, visit www.DunkinDonuts.com.